Over one million horses accompanied the British Army to France where they were used extensively for haulage and transportation. The use of cavalry decreased in this mechanised war, though they continued to play a role and heroic charges were subjects beloved by artists such as Richard Caton Woodville in the ILN. The Illustrated Sporting and Dramatic News, which devoted a large number of pages to racing, polo and hunting in peacetime, naturally took a particular interest in the wartime role of the horse. Its first issues of the war featured photographs of horses being commandeered on the south coast for the B.E.F., and it took a particular interest in the work of the Army Remount Service, which had depots around the country where horses and mules were broken in or reconditioned for army use, often employing women. The Remount Officer for the Berkshire area was the illustrator Cecil Aldin, a regular contributor to the ILN magazines both before and after the war. Horses remained a potent symbol of British honour and sacrifice and it is significant that one of the most famous pictures of the war was Fortunino Matania’s, ‘Goodbye, Old Man’, of a gunner bidding farewell to his dying horse. Originally painted for the Blue Cross Fund it was reproduced several times by The Sphere. Dogs too had a role to play in the war. The Belgians used them to haul light gun carriages, some acted as “ambulance dogs” to search and stay with men on the battlefield, and others were trained to lay communication wires along the front line. Their speed and agility was exploited to the full when the British began to use them as messengers at the front, an idea pioneered by Major Edwin Richardson who was aware the Germans were using them with some success. 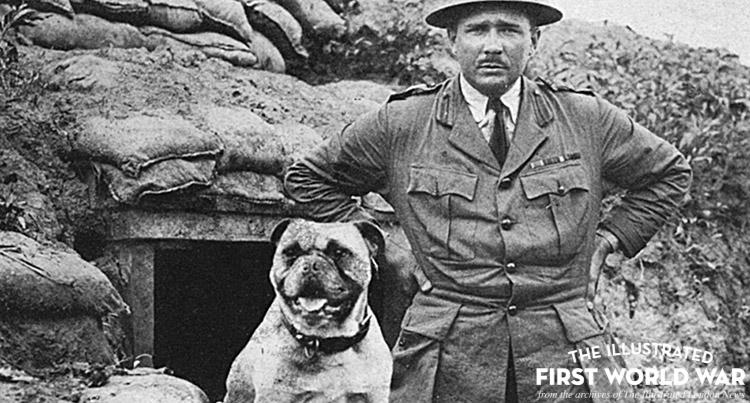 He established a British War Dog School where he trained hundreds of dogs – some strays, some donated family pets – to successfully run missions in the midst of battle, saving countless lives in the process. Pigeons too were part of this military menagerie, their speed and homing instinct making them natural messengers. Cats might prowl the trenches to help out with the rat problem. But perhaps the most unusual animal war-worker was Lizzie, a circus elephant, who became a familiar feature of wartime Sheffield, used to haul munitions around the cobbled streets.